The Copious Christian: God Be Praised! So yesterday I wrote an article about John Fugelsang and his discussion with Bill Donohue, I sent the article to Mr. Fugelsang and was fortunate enough to have a brief exchange with him on twitter. I'm pleased with what happen. Why? Mr. Fugelsang wasn't compelled by my argumentation, he didn't repent (I'm not 100% convinced he read the article entirely) and he basically called me a bigot, why would I be happy about that? Simple answer, God used me to bring judgment. I've prayed for God to use me for His will and He has. He used me to bring judgment. All too often we as Christians preach the gospel and feel a sense of failure when we are rejected or ignored. Jesus had no such attitude and nor did the apostles. The success of The Gospel isn't in our hands, it's in the hands of God, God simply left us the charge to preach His gospel. I started this blog as a way to reach atheists but that motive changed and now I write these articles mainly for Nominal Christians, the camp where Mr. Fugelsang finds himself, people who claim to be a follower of Jesus but for whatever reason openly ignore His teachings and deny that they're doing so. 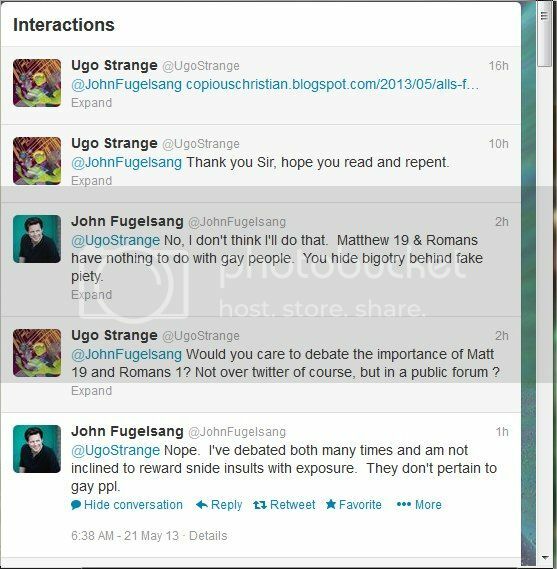 I provided Mr. Fugelsang answers for his "arguments" that are consistent with Biblical teachings, I used scripture to support my conclusions and left him with no excuse to continue his foolish level of "argumentation". I openly admit that the tone of my article was indeed snide but I NEVER insulted Mr. Fugelsang, I used his own words against him, if that can be considered an insult then I guess I did insult him. I called his argument "rambling" (because it's non-sense). If anything I insulted the people who would find his "argument" compelling, I called those people "short-sighted, shallow thinking people" and by Mr. Fugelsang's remarks and the MANY comments on the video I linked in my article, they're only proving me 100% right. In conclusion, if he continues (which I am 100% sure he will) even after being corrected, God's wrath will be upon Him, and God's wrath when measured out against unbelievers is also a cause worthy of praise since God is justified in His wrath. I pray Mr. Fugelsang repents before it's too late for him.